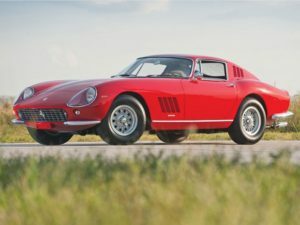 What Did the Ferrari 275 Sports Car Cost ? Designed to compete against a rising tide of high performance automobiles in its day, the Ferrari 275 sports car was the first Ferrari with all-independent suspension five gears and four -cam 300 bhp V12 engine. For a car which remained in production for only four years, and which fewer than a figure of 1,000 were built, the Ferrari 275 has had a remarkable impact in the realm of the classic two-seater high-performance GT coupe. For perhaps a decade after the last 275 was completed in 1968 the car was widely regarded as one of Ferrari’s stepping stones on its way to pre-eminence a builder of exotic road cars. However by the late 1970’s prices of 275’s were beginning to rise and today command sums as high as you would encounter for what might be referred to as loosely post-war classics ( except one other Ferrari the ultra-rare Daytona Spyder). In the mainstream of Ferrari development the 275 might be said to have fitted between the earlier 250 and the later Daytona. In fact the Daytona is not the same sort of beast, since the 250 and 275 were really Ferrari’s light coupes at a time when heavier 330s were also on the scene. The light role was later assumed by the Dino 308’s, though they lacked the appeal of the 275’s hefty V12 engine and the straightforwardness of the front-engine layout. The 275 was an important design for the Ferrari team and stable in more than several ways. In many ways it is said by aficionados to be the first road-going Ferrari to have all independent suspension, a proper five speed gearbox and eventually a four-cam engine. It also can be said to have replaced the 250 at a most vital point in time – a moment when Ferrari’s famed reputation was under threat from two quarters: from Jaguar, whose E-type offered highly competitive performance and a quality chassis at an unbelievably low price, and from the factory upstart Lamborghini whose factory only a scant few miles from Modena had started producing GT cars with four-cam V12s of a quality to excite the aficionado. Compared with the 250, therefore the 275 the 275 had to offer three things if it was to succeed. Its performance had to be better, its chassis improved and its appearance superb. It succeeded none the less across the board. The performance aspect was the most easily attended to. There were still some stretch left in the classic Colombo-designed 60-degree V12 which had started Ferrari on the path as a most serious car-builder. Not a lot but enough. There was no easy way in which the stroke could be extended beyond the 58.8 mm of the 250 unit, but the apertures for the wet liners in the alloy block could be further eased out to take the bore to 77 mm. This meant that the capacity was increased from the nominal 3 liters to 3.3 (actually for purists to 3286 cc). In those days Ferrari still used the system of naming models after the capacity of a single cylinder of the V12 engine. Hence the car was designated 275 in succession to the 250. It is worth bearing in mind that his choice of engine capacity also had a particular appeal to the American market, since 3286 cc is, as nearly to most people would care the equivalency of 200 cubic inches. The rest as they say to say the least is what makes the Ferrari 275 legendary and its placement in the history of Ferrari remains centerpiece.